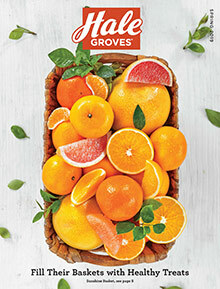 Bring home the sweet juicy taste of fresh Florida citrus with the Hale Groves catalog and bountiful coupon code savings. Choose a box or basket of fruit, or any of their other Florida gifts! Enter the code - 782024 - at checkout on the Hale Groves website. Delicious Florida fruit gift basket choices - Imagine receiving fresh Florida oranges and grapefruit in the middle of winter. Hale Groves lets you send fresh tropical fruit baskets to the special people in your life for a bit of Florida sunshine anywhere. Their seasonal fresh fruit baskets and gift boxes are guaranteed to arrive filled with the freshest of nature's fruit, from Honeybells, navel oranges, apples and pears to strawberries, peaches, and cherries. Enroll in the Tropical or All Seasons Fruit Club - Keep the delicious tastes coming month after juicy month when you enroll yourself or someone special in a monthly fruit club. Choose a citrus lovers club to enjoy fresh from the grove navel oranges, grapefruit, and Honeybells. Or select a year round club to enjoy all of nature's finest fruits, from navel oranges and grapefruit to grapes and kiwis. Rich tropical desserts - Indulge in freshly baked Florida desserts from tangy Key Lime cake or orange cake to oh-so-rich Island Rum cake. Or select a luscious chocolate cake, Key Lime Cooler cookies or Rugelach. When you shop Hale Groves' bakery on the Internet, baked goods fresh from the kitchen are only a click away. Corporate gifts - Florida fruit gift baskets or boxes of fresh fruit make a wonderful corporate gift any time of the year. Choose the right basket for each vendor, client, or employee for a gift that will be enjoyed bite after sweet bite. Or enroll your clients or special customers in one of Hale's fruit clubs for a gift that will say thank you month after month. Sweets and treats - Who could resist chocolate covered grapes or cherries, chocolate caramel pears, or chocolate oranges? Add some of these wonderful gourmet treats to your fruit gift basket order, then sit back and accept the thanks! Don't forget to treat yourself to a few, too. Sweet and tasty honeys and marmalades - Make your tea and toast sweeter with a honey sampler pack including palmetto, Tupelo, wildflower and orange blossom honey. Or select a combination box, with a variety of Florida marmalades and honeys. The unforgettable honeybell, oranges, navel oranges, grapefruit, berries, and other seasonal fruits - the best of nature's fruit is at Hale Groves.